The topological properties of interbank networks have been discussed widely in the literature mainly because of their relevance for systemic risk. Here we propose to use the Stochastic Block Model to investigate and perform a model selection among several possible two block organizations of the network: these include bipartite, core-periphery, and modular structures. We apply our method to the e-MID interbank market in the period 2010–2014 and we show that in normal conditions the most likely network organization is a bipartite structure. In exceptional conditions, such as after LTRO, one of the most important unconventional measures by ECB at the beginning of 2012, the most likely structure becomes a random one and only in 2014 the e-MID market went back to a normal bipartite organization. By investigating the strategy of individual banks, we explore possible explanations and we show that the disappearance of many lending banks and the strategy switch of a very small set of banks from borrower to lender is likely at the origin of this structural change. 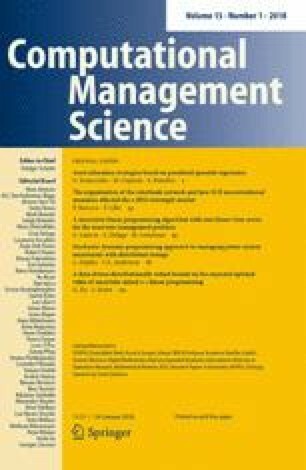 Authors acknowledge partial support by the grant SNS13LILLB ”Systemic risk in financial markets across time scales”. This work is supported by the European Communitys H2020 Program under the scheme INFRAIA-1-2014-2015: Research Infrastructures, grant agreement #654024 SoBigData: Social Mining and Big Data Ecosystem (http://www.sobigdata.eu). Authors also thanks Fabio Caccioli, Thomas Lux, and Daniele Tantari for useful discussions. The discrete model (Fricke and Lux 2015). It involves the minimization of a cost-function associated to each discrete assignment of the nodes. Each link between nodes inside the core lowers the cost-function while each link between nodes inside the periphery raises it, no contribution comes from the links between core nodes and periphery nodes. It has been shown (Lip 2011) that this minimization is equivalent to sort nodes in the graph by descending degree, (\(k_1>k_2>\cdots >k_N\)) and consider the first s nodes, where s is such that \(k_s > s+1\). Being dependent on the average degree and not on its directionality, this method is insensitive to directed bipartite structures, where there is large directed flow from one group of nodes to another, since nodes with high out-degree and nodes with high in-degree end up inside the core. Also in this case the symmetry of this coreness measure does not help to understand whether the underlying network has a bipartite structure or a core-periphery structure. This model, as shown in Fricke and Lux (2015), catches the directed structure of the network and indeed significant differences are found between out-coreness and in-coreness. This is a clear indication that a community structure more suitable to grasp the properties of e-MID interbank market is most probably a bipartite one. The tiering model (Craig and Peter 2014). It can be regarded as an extension of the discrete model, incorporating the role of asymmetric links and of inter-group links. The basic idea is that a core-node should have both a non-zero in- and out-degree. It relies on a tiering model for banks in a market, the core is a set of intermediary banks that both borrow and lend money to periphery banks. All these methods, especially the directed ones, manage to grasp some of the properties of the e-MID interbank network but a major drawback is that they fix a-priori the block-structure one is supposed to find in the data. In our work we use a well-established model for community detection, the Stochastic Block Model, that allows us to extrapolate the block structure from the data only, without imposing constraints on the mutual relations between groups. As we outline in the text, at all levels of aggregation the unweighted network of e-MID market exhibits a directed bipartite structure, also confirmed by a detailed enquiry of the dynamics of the trading inventory of banks.